About "NIV Cultural Backgrounds Study Bible"
Customer Reviews For "NIV Cultural Backgrounds Study Bible"
This new study Bible ought to be in the library of every minister or Christian. Through detailed book introductions, comments and notes on almost every page, and full-color maps and charts, the Bible student will learn about the cultural background of the biblical books which will shed interesting light and insight. For a long time, the Scriptures have been read through Western lens. This study Bible does the Christian Church a great service by underscoring the need for us to read and study the Bible against its cultural backdrop. Highly recommended! This is an excellent Bible by two of the most amazing and critical scholars of our time. if you enjoy this check out their 2 volume commentary the IVP Bible Background Commentary. Excellent layout, charts and maps and historical and cultural information to enhance your understanding of the Bible books. However I would define this Bible as a more historical background Bible than cultural. The contents could have been enhanced by small margin notes about cultural context such as comments on early Christian meetings which days or comments on Paul shaving his head because of a vow just to name a few. No detailed comments have been made regarding certain practices e.g. Jewish burial practice next to the paragraph about the Lord's body being taken down. The contributors toed the traditional line of crucifixion even when detailing the Passion Week citing Friday when there is ample evidence to say it probably was a Wednesday - just to give an example. Overall a great reference tool to enhance some background information, easy to read and well laid out. 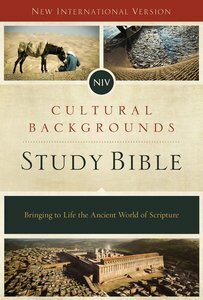 This is an excellent NIV Study Bible for anyone who wants to understand the historical and cultural context of scripture. I have a much better understanding of some of the more difficult books of the Bible because of the historical and cultural explanations that the editors provide.